WARNING: This post contains spoilers. Do not continue reading if you didn’t “Bravo,” AKA watch what happened! I’ve seen every season of “Top Chef” without fail — even the Masters, All-Stars and Just Desserts spin-offs. I’ve bet my friend Cosmo the past few seasons, this time with a draft of chef teams (I won, natch). But I worry my dedication will change if it continues to be so gimmicky. The finale began with a cheering crowd of 150+ diners. Host Padma Lakshmi greeted us to explain the remaining two chefs’ challenge: Create any five courses. The first chef to create three winning dishes will be crowned the 10th Top Chef — and only second female to do so. Each plate served at Judges’ Table produced a round win before the chefs were sent back to cook again. So why the need for a live audience? Why not just cook for the world’s toughest critics, plus the judges who’ve scrutinized them since the first week? It all feels campy and hacked. The rest of the episode was chopped up with moments from this season and the past nine, something I’d rather be left for a reunion special than a finale. We’ve already watched each week; we know what went down. Showcase the techniques they’ve put into what’s now the most important plates of their lives. 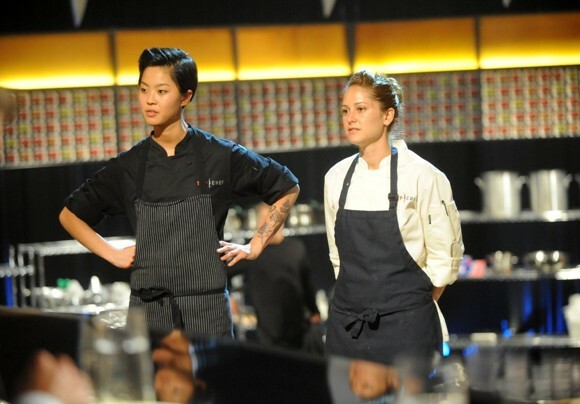 I’d already scowled at the return of “Last Chance Kitchen,” which gives axed chefs the opportunity to rejoin the competition at semifinals — and in Kristen’s case, cook their way into the finale to win it all. Sure, she had to beat out the other losers. But the beauty of “Top Chef” for the first eight seasons was being sent packing for ONE bad dish. Then, there was the #SaveChef competition, where Twitter users vote to have a chef try AGAIN in “Last Chance Kitchen” to possibly rejoin at semifinals. Someone could, in theory, win the whole shebang with three extra lives. In past seasons, too much salt sent home a culinary prodigy. A frozen protein was the farewell ticket for others. The choices they make under pressure should be enough to speak for their decisiveness, and giving them another chance (or more!) is as infuriating as awarding participation trophies. I still love Padma, Tom, Gail, et al. I know I’ll keep coming back, if only for the annual wager with Cosmo. I’d just love to see it return to what made it such a likable show to begin with: chefs cooking for world-renowned judges, and not succumbing to the pressures of reality TV. Magz says : 02.28.2013 at 9:37 am.p. Hope Cosmo’s new job pays well! You should enjoy the win!